Don’t we all need and love a little romance in our lives, so Valentine’s Day creates a welcome little flutter of excitement for everyone from 9 to 90. Teenagers are in a state of wild anticipation and intrigue. Nowadays there are all sorts of techie ways to get your message across whereas a Valentines Card, usually anonymous, was the best we could do and oh, the nail biting! So let’s mark the occasion with whatever gesture works for you – a romantic table for two in your favourite restaurant, a bunch or even a single red rose, may sound a bit ‘cheesy’, but still gives the recipient an ‘oops’ in their tummy and a warm rosy glow. How about a bag of heart shaped cookies or a gorgeous chocolate cake! 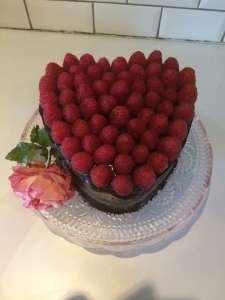 Pam’s Valentine Chocolate Cake is guaranteed to produce a gasp of appreciation and you will have the best fun making and assembling this luscious confection. If you haven’t managed to secure a restaurant booking to wine and dine your sweetheart it’s probably too late by now but fear not, there are lots of other ways to make a big impression. Why not invite your beloved around for supper and rustle up something delicious and comforting- a risotto is easy and great for sharing. Follow it with a green salad and maybe preceede it with a couple of dozen native Irish oysters, could be au naturel, with just a segment of lemon and a glass of bubbles. In case that sounds like too much of a challenge – the curvy Gigas oysters are less expensive and even better for cooking than the deliciously briny natives that are best enjoyed unadorned. Oysters have quite a reputation…. An addictive combination, we use the Gigas oysters for this dish. Peel and slice the shallots or onions thinly. Spread out on kitchen paper to dry. Meanwhile make the najmim, and keep in a glass jam-jar. Heat about 2.5cm (1inch) of oil in a frying pan, fry the onions until crisp and golden. Lay a few sprigs of seaweed on each plate, if available. Open the oysters and nestle 3 or 4 on top of the seaweed. Spoon a generous half teaspoon of namjim on top of each oyster and top with some crispy onions and a sprig of fresh coriander. Even though Pacific oysters are available the year round, they are best in winter. To make the Asian vinaigrette, mix all the ingredients in a glass jar, seal and shake well. If you can get some, place a little fresh seaweed on each plate. Arrange 4-5 oysters per person on top and spoon a little vinaigrette over each one. Serve with segments of lime. If you can find some fresh seaweed e.g. bladder wrack, dip the fonds into boiling water for a second or two, they will turn bright green. Drop it straight into a bowl of iced water to prevent it cooking and to set the colour. It will make an attractive garnish, which you could eat it if you were very hungry but it doesn’t taste delicious! Use it soon otherwise it will go slimy. This unexpectantly delicious combination of winter flavours is guaranteed to convert even the most ardent parsnip haters and can of course be made ahead. Melt the butter and toss the diced onion, parsnips, fennel in it. Season with salt and freshly ground pepper. Cover with a butter wrapper or paper lid and the lid of the saucepan. Cook on a gentle heat for 10-15 minutes or until soft but not coloured. Add the hot stock and simmer for about 20 minutes or until the vegetables are completely soft and tender. Add the milk and cream. Liquidise or puree in a blender. Taste for seasoning. Serve in bowls or a soup tureen sprinkled with finely chopped herb fennel or the tops of the fennel bulb. Pull or peel strings off the outer leaves of the fennel bulb if necessary. Trimmings can go into a stock pot. First bring the broth or stock to the boil, turn down the heat and keep it simmering. Melt the butter in a heavy bottomed saucepan with the oil, add the onion and sweat over a gentle heat for 4-5 minutes, until soft but not coloured. Add the rice and stir until well coated (so far the technique is the same as for a pilaff and this is where people become confused). Cook for a minute or so and then add 1/4 pint (150 ml/generous 1/2 cup) of the simmering broth, stir continuously and as soon as the liquid is absorbed add another 1/4 pint (150 ml/generous 1/2 cup) of broth. Continue to cook, stirring continuously. The heat should be brisk, but on the other hand if it’s too hot the rice will be soft outside but still chewy inside. If it’s too slow, the rice will be gluey. It’s difficult to know which is worse, so the trick is to regulate the heat so that the rice bubbles continuously. The risotto should take about 25-30 minutes to cook. When it is cooking for about 20 minutes, add the broth about 4 tablespoons (5 American tablespoons) at a time. I use a small ladle. Watch it very carefully from there on. The risotto is done when the rice is cooked but is still ever so slightly ‘al dente’. It should be soft and creamy and quite loose, rather than thick. The moment you are happy with the texture, stir in the remaining butter and Parmesan cheese, taste and add more salt if necessary. Serve immediately. Risotto does not benefit from hanging around so enjoy it immediately. Add 110 – 175g (4 – 6oz) cooked and peeled shrimps to the risotto just before the end of cooking. 1 – 2 tablespoons (1-2 American tablespoons) of freshly chopped dill are also a delicious addition. If possible use shrimp or fish stock but light chicken stock will also be delicious. Destalk and cook curly kale, red Russian or cavalo nero kale in boiling salted water until almost cooked (see recipe). Drain well, stir in the risotto about 5 minutes before the end of cooking. Taste and correct the seasonings and serve sprinkled with freshly grated Parmesan cheese. Cream the butter, add the icing sugar and beat well. Add the vanilla essence then stir in the cornflour, flour and a pinch of salt. Mix to a dough. Flatten into a round, cover and allow to relax in the fridge for 30 minutes. Roll the dough to a thickness of 3/8 inch (7mm). Stamp into heart shapes with the cutter. Transfer to baking sheets lined with silicone paper (non stick). Bake for 15-20 minutes or until pale golden brown. Transfer to a wire rack with a fish slice and allow to cool. Meanwhile chop the chocolate. Warm the cream in a small saucepan, add the chocolate, turn off the heat and stir until melted. Transfer to a bowl and allow get cool. Whisk to thicken to a spreadable mousse like texture. Fold in finely chopped toasted hazelnuts. Sandwich the biscuits together with the chocolate spread. Sprinkle with icing sugar. Substitute raspberry jam for the chocolate filling in the above recipe. Pam Black is one of our senior teachers here at The Ballymaloe Cookery School, once seen never forgotten. She has bright red hair, swept up into a brilliant distinctive ‘Jedward’ style. You may have seen her on the ‘Afternoon Show’, so you’ll know how she loves to bake and how gorgeous her confections are. Cream the butter and sugar together in a large bowl until light and fluffy. Add the eggs, one at a time beating well after each addition. Sift the flour, baking powder, cocoa and drinking chocolate together in a bowl. Gradually fold into the egg mixture. Finally fold in the yoghurt. Divide between the two tins. Cook in the preheated oven for 25-30 minutes until firm to the touch. Cool on a wire rack. To make the chocolate buttercream filling. Cream the butter in a bowl until light and fluffy. Add the sieved icing sugar and cocoa, beat well then add the hot water. Sieve the icing sugar and cocoa powder into a bowl. Heat the butter, water and vanilla extract in a saucepan until just at boiling point. Pour into the icing sugar and cocoa, beat well with a wooden spoon. Note: If the icing is too thick, add a little more warm water. Fill the cakes with most of the chocolate butter cream and sandwich together. Place on an upturned plate or icing turntable and carefully spread with chocolate glace icing. 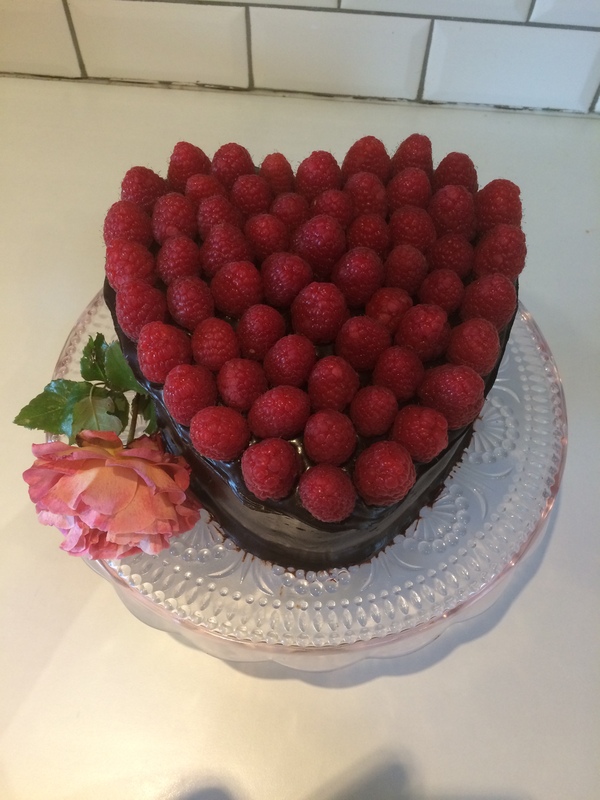 Arrange the raspberries snugly over the top of the cake. The English Market in Cork will as ever be choc a bloc with delicious temptations for St. Valentine’s Day. If you go along to On The Pigs Back you’ll find the little Coeur de Neufchâtel, a heart shaped raw cow’s milk cheese – how cute would that be with a few Sheridan’s cheese biscuits. Fresh from West Cork resumes with a lovely new stall at the wonderful Bradley’s Artisan Food Shop & Specialist Off Licence, North Main Street, Cork, selling over 80 delicious food products from more than 40 West Cork food producers. Bradleys, established in 1850 as a dairy, is now run by Michael Creedon the 5th generation of his family and open Monday to Saturday, 8am to 9.30pm telephone 021 4270845. Cros Naomh Bhríde We have had lots of queries since the article on St Brigid’s day about where to buy a cross. How delighted I was to find some for sale in the Ballymaloe Shop, made by Naomh Padraig Handcrafts, Strokestown, Co Roscommon. Tel 071 9637077 for a list of other stockists. ? Has carried on the tradition for years and tells the story of Bridget of the Gaels. Toby Simmons of Toonsbridge Dairy, near Macroom continues to add to the impressive list of buffalo’s milk cheeses he and his Italian cheesemaker, Franco Picciuolo make. So great to have an Irish buffalo milk mozzarella but look out for Toonsbridge Caciocavallo, Toonsbridge Greek style brined cheese and halloumi and occasionally you may be fortunate enough to find a burrata, a tender mozzarella type cheese oozing with rich cream, divine. Check www.therealoliveco.com for details.